Despite modest growth and poverty reduction, some important gains in the health status of the population have been achieved in the Middle East, thanks to improvements in technology, health service delivery, and public health programs. However, the whole region still faces important public health challenges. For example, although the region has decreasing rates of communicable diseases, it has increasing rates of noncommunicable diseases (NCDs). This group of diseases, also known as chronic diseases, are not passed from person to person and tend to be in general of slow progression. The four main types among these diseases are cardiovascular diseases (like heart attacks and stroke), cancers, chronic respiratory diseases (such as chronic obstructed pulmonary disease and asthma), and diabetes. These diseases are driven by factors that include ageing, rapid unplanned urbanization, and the globalization of unhealthy lifestyles. Among the last category are unhealthy diets, tobacco use, lack of physical activity, and obesity. They may lead to raised blood pressure, increased blood glucose levels, and elevated blood lipids. The economic costs of these diseases can be considerable. In low-resources households, health care costs for cardiovascular diseases, cancers, respiratory diseases, and diabetes can quickly drain those resources and drive families into further poverty and hinder the country’s economic development. Some relatively new diseases are emerging, such as HIV/AIDS and, in some areas old diseases are re-emerging, as is the case with tuberculosis. Although HIV prevalence rates are low in the countries in the Middle East, the risks for further spread exist. Should this happen, the infection could have significant social and economic consequences. Communicable diseases, in contrast to chronic diseases, spread from one person to another or from animal to person. The spread usually happens via airborne viruses or bacteria, but also through blood or other body fluids. Among this group of diseases are malaria, tuberculosis, measles, HIV/AIDS, Ebola, influenza, hepatitis, and poliomyelitis. Malaria, tuberculosis, and measles are responsible for a significant proportion of the region’s morbidity. The conflicts afflicting the region have provoked an increase in the incidence of communicable diseases. 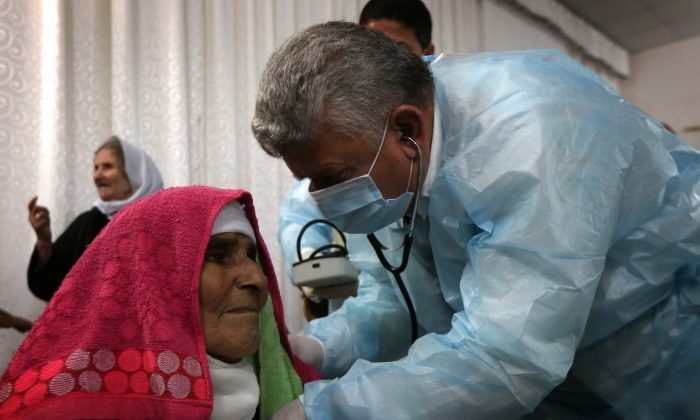 This is the case in Gaza, where the recent conflicts have led to outbreaks of water-borne and food-borne diseases as a result of contamination of drinking water with raw sewage. International health organizations confirmed these facts. The wars in some countries, such as those in Syria and Iraq, have led to a substantial emigration of doctors, which has added to the problems of already insufficient qualified health personnel. In Iraq, the number of physicians has been decimated by the continuing conflict in that country. In addition, the conflicts have led to the destruction of a significant part of the health infrastructure in the country. Although progress has been made in the health status of mothers and children in most countries in the region, disparities within these countries persist, making this progress inequitable, as has been reported by UNICEF. “The health and well-being of mothers and children is often determined not by the country they live in, but by their income and where they live within a country,” said Shashia Azfar, UNICEF regional director for the Middle East and North Africa. Most health services in the region are still based on a curative model, which is expensive to maintain and also inefficient in addressing new health challenges. That is why health care services will have to increasingly include the provision of preventive and promotion services and improve primary health care to attend to the most immediate health needs. Although some countries have the economic resources to face this challenge, they have to be redirected in a way to make them more effective. Because the Middle East region is composed of a diverse mix of countries ranging from very poor ones to wealthy oil-exporting countries, there are no solutions that uniformly apply to all of them. A thorough evaluation of the situation in each country, however, can provide the information to apply the best approach to solve the health problems in each of them. Dr. César Chelala is an international public health consultant, and a winner of an Overseas Press Club of America award and a national journalism award from Argentina.